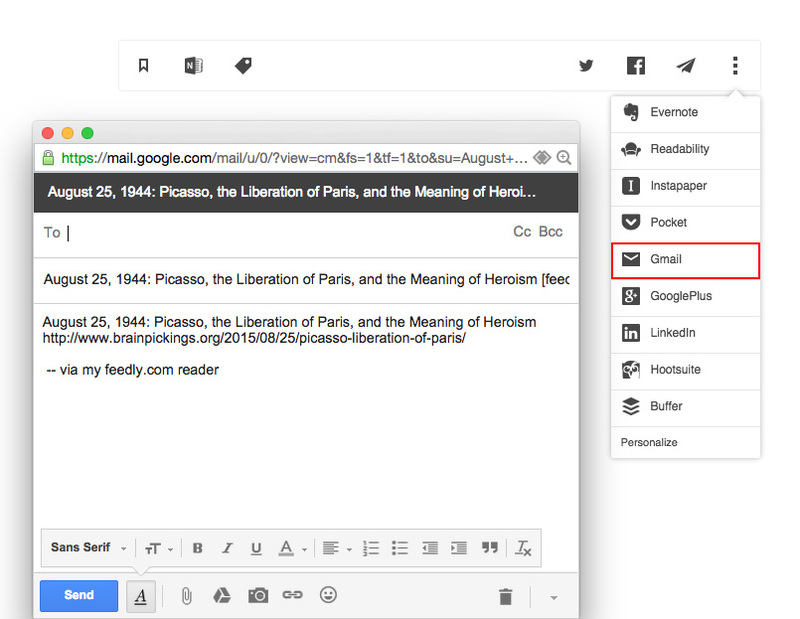 feedly has gone beyond just a place to find and organize the content you read. With feedly, you can easily share stories to your Facebook, Twitter, LinkedIn, and hundreds of other services using IFTTT. Sharing stories shows others what you’re reading and helps keep your friends and teammates up-to-date on content you think is important. Pro tip: All of your sharing options will appear in the article toolbar or in the overflow menu at the top of each article. To customize which sharing services appear in the article toolbar, click on Preferences in the left-hand navigation menu and go to Favorite Sharing Tools. Here, you can select the nine sharing and saving tools you use the most. Sharing to social networks such as Facebook and Twitter helps you better interact with your following and establish your presence on these networks. You an share stories that you read in feedly to your favorite social networks without having to even open a new page. 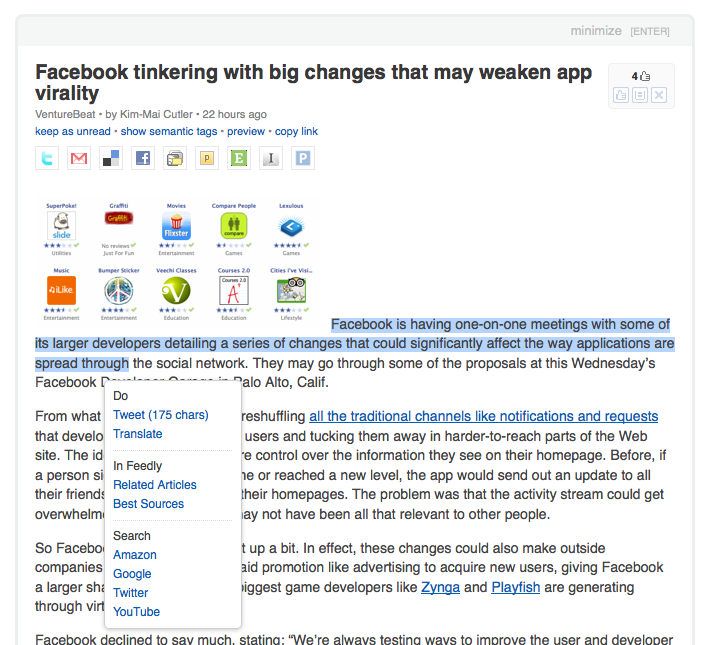 Simply click on the Facebook or Twitter icon in the article toolbar, or find them under the three vertical dots. A pop-up will show your post, all you have to do is click Share. Sharing stories to LinkedIn is a proven way to improve your visibility on the number one professional social network and the third-fastest-growing social network. Sharing through LinkedIn has proven to be more effective than sharing through any other social network. Feedly has provided a way of easily sharing stories to LinkedIn with just a few clicks. 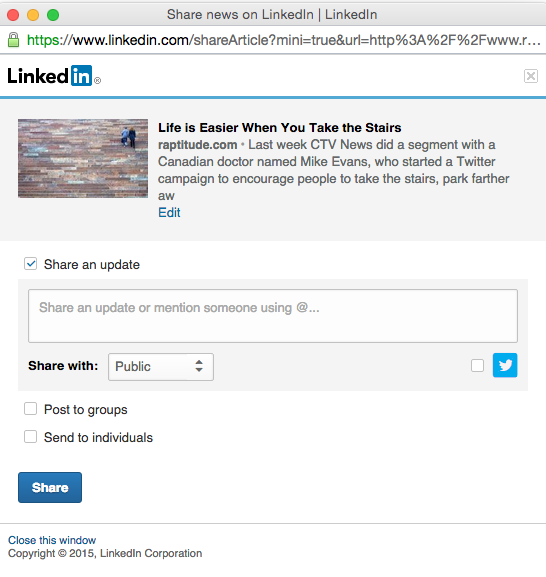 To share to LinkedIn, click the three vertical dots at the top right corner of the article then click on LinkedIn in the drop-down menu. A pop-up will show up with a post that’s ready to go. Feel free to add a caption or change the preview image, then share it with all of your LinkedIn connections. If you want to share a story that you read in feedly with one of your friends or teammates directly you can do so by sending it to them in an email. Sending a story through an email in feedly is easy because all of the important parts of the story will already be in the body of the email, all you have to do is type a recipient’s name and click Send. It can be useful to schedule certain posts to publish at on a particular day or at a certain time of day when there is more traffic to your social network. When you share links to stories you read in feedly, you want to make sure you’re sharing at the right time. With feedly Pro, you can use Buffer and Hootsuite, social media scheduling tools, to schedule your posts. Both icons appear under the three vertical dots in the article toolbar. Another useful feature of feedly Pro is integrating with IFTTT, a tool that connects the different web services you use and automates their processes. Some of the social networks you use may not be integrated with feedly yet. You can share stories to these social networks easily with IFTTT. If you add a specific tag to a story you want to share, IFTTT will see that as a trigger to share it on your social network – it’s completely automated. We have a separate tutorial on IFTTT if you want to learn more. You can use IFTTT to not only post to your social networks, but to post to other medium, such as Trello, WordPress, Salesforce Chatter, and tumblr. If you are an avid blogger, and love reposting the content you find on feedly, you can do so automatically through IFTTT by posting automatically to Blogger, Tumblr, and WordPress. Some of the content you read in feedly is great for business, and sharing stories with your teammates can help inspire your company. You can use IFTTT to share to Salesforce Chatter and Slack when you tag a story as such so that everything happens in the background. Sending stories to other medium simply for your own productivity and use is also possible through IFTTT. You can send stories to Trello, Yammer, and Google Drive to track your progress or list of to-dos. Click on Preferences at the bottom of the left hand navigation menu and scroll down until you see Custom Sharing, a feature of feedly Pro. Pro tip: This is where you can select which sharing services appear in the article toolbar. You can select up to nine of the tools you use most often. Replace “email@mail.com” with your recipient’s email. 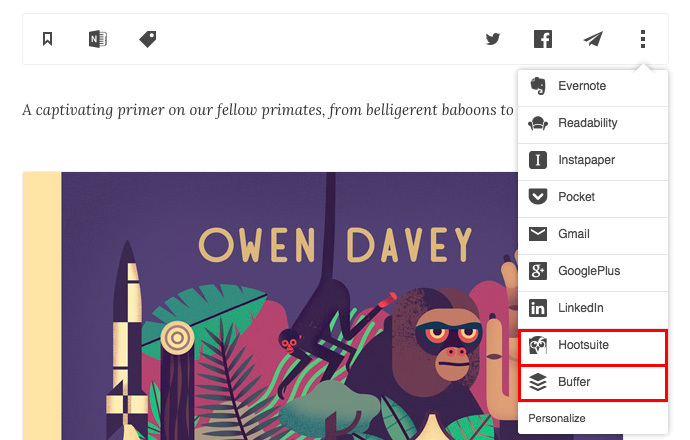 Once you’ve set up Custom Sharing, all you have to do to share a story is click the Custom Sharing icon, a paper airplane, in the article toolbar. A pop-up window will show the post before it sends. Once you’ve reviewed it you can hit send and keep reading. Questions? We want to hear your feedback. Email us at tutorials@feedly.com. A quick note to let you know that there is an issue in the feedly+twitter integration. The dev team is aware of the problem and is working on a fix. We will be releasing that fix by Friday night. 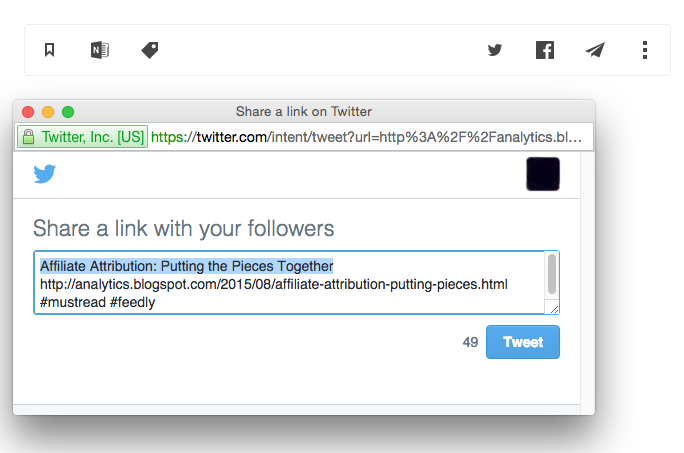 As a temporary work around, you can use the buffer sharing option to post your tweets. We will update this post as soon as we have more information. Twitter announced the New Twitter today. We are taking the feedly+twitter integration offline for a couple of days to transition to the new twitter @anywhere API. Thank you for your patience. As you can see, when you highlight some text, a contextual menu automatically appear. One of the actions in that menu is Tweet, allowing you to easily share quotes on twitter in 2 clicks. As a convention, we are prefixing twitter quotes with #Q so that over time people can do interesting things using the search engine (you are welcome to create your own convention). Similarly, if you are on a web page and use select some text before you click on the tweet action on feedly mini, you will see a similar behavior. This is the first of a long series of features we will be releasing in November and December around the theme “Make sharing easier”. PS 1: the behavior of the translate feature was inspired by a presentation from @azaaza regarding “more personal browsers”. PS2: These feature are available now in the 2.x.104 version of feedly for firefox and will be available in the 0.8 version of feedly for chrome which should go out next week.